I'm continuing to cook from Vegetable Literacy by Deborah Madison* this month for Cookbook Countdown (read more about it here) but I've decided to leave the land of vegetables with this recipe for one of my family's favourite breakfast foods: waffles. The batter was made with buckwheat and spelt flours, milk, eggs, oil and just a little honey for a touch of sweetness. 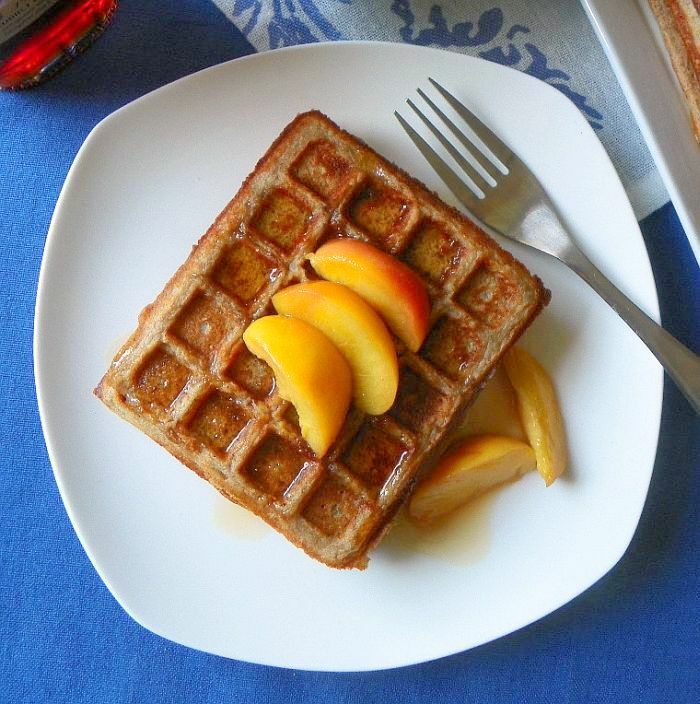 It also included yeast which made the waffles light and airy but meant you had to allow time for the batter to proof. Overnight fermentation in the fridge worked best for me so I could get straight to cooking them first thing in the morning. They had incredible flavour and crisped up nicely in the iron but they softened very quickly. This was also true of some frozen ones that were heated in the toaster later. The same batter can be used to make pancakes so I think I'll try that next time. Regardless, they were a delicious way to start the day topped with roasted peaches and maple syrup. * This book is organized according to families in the plant kingdom; buckwheat is part of the Knotweed family which counts sorrel and rhubarb among its members. Looks mega delish! Buckwheat and spelt flours... they are right up the alley for... my DH! But it has been very difficult to get spelt flour where I am. So might want to sub with something else. Wow, fabulous waffles! It has been quite sometime since I last made any waffles. Need to dig out my waffle maker from "I cannot remember where it is stored"! 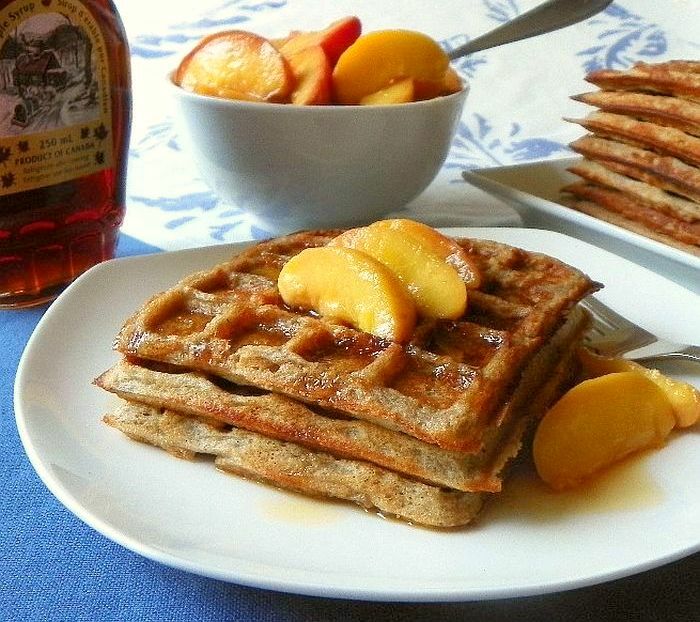 Roasted peaches and maple syrup sounds yummy with the waffles! Waffles every Sunday morning here. Have to try this recipe.